Iconic city or concrete jungle? Akhilesh Yadav, chief minister of Uttar Pradesh, has laid the foundation of the Trans-Ganga project on December 11. Yadav has promised a modern and green city under this project which will be located in Unnao district. The project was launched two years ago. Big advertisements have started showing in leading newspapers. The chief minister’s Facebook page also posted the announcement of the event, which shows how proud he is about the project. To learn more about this project, I tried to contact the Uttar Pradesh State Industrial Corporation (UPSIDC), the project developer. The officials were not ready to give out the details of the project. A few of them replied, but reluctantly. They gave only the information like the area of the project and location. They said that the project is spread over more than 400 hectares and the site is on the banks of the Ganga and is located opposite Kanpur city. The main USP of the project, according to Arun Kumar Mishra, chief engineer of the project at UPSIDC, is that it is located close to the Ganga. This seems to be the dream project of Yadav. The state has said that there will be an investment of Rs 10, 000 crore after the mega project is implemented. The project also promises employment to more than 100,000 people. The state government has promises to make this project completely equipped with facilities like an automobile hub with modern auto expo mart, mega malls, exhibition centres, parks and group housing societies. 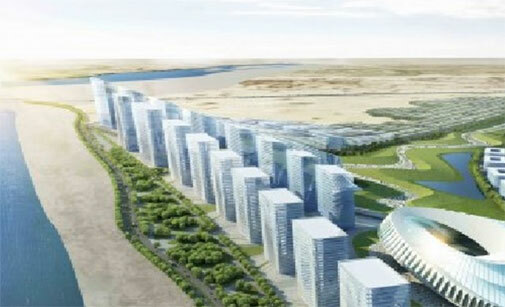 The master plan of the project will be developed by Studio Symbiosis, an architectural firm. “The new industrial township is going to be sustainable on all parameters and, hence, care has to be taken at both planning and implementation levels,” says an official at Studio Symbiosis. The project will be implementing rainwater harvesting and wastewater recycling systems. Amit Gupta, the principal architect of this project, says that under the project, along with industrial and residential areas, commercial and institutional areas will also be developed. Now, this rings an alarm bell. Mixed development means that both industrial and domestic wastewater will be generated. The project will be using almost 17,000 kilolitres of water per day (KLD) for all its domestic purposes, says a source who does not want to be named. I also came to know that Uttar Pradesh Jal Sansthan will be setting up a station to pump water from the river. This means a huge amount of domestic waste (as a thumb rule eighty percent of water used gets converted to sewage) will be generated. Now the question that comes to my mind is: how much sewage will be generated and how will the project implementer or the developer manage it? According to a source, the amount of sewage that will be generated is 12,500 KLD. The source adds that care will be taken that sewage does not enter the river. The industrial effluents will also be managed so that the river water is not polluted. For this, a zero liquid discharge has been proposed at the site by the environment consultant. UPSIDC promises that they will be taking all the measures not to harm the ecology of the river. To get a clear idea whether this project will be harmful to the ecology of the river, I contacted the state monitoring agency—State Pollution Control Board (SPCB). It was surprising to know from Ram Karan, regional officer, State Pollution Control Board (SPCB), Unnao that no information has been passed over to them on the type of industries that will come up in the area. It has been only said that the units will be green. Karan hopes that enough care will be taken to tackle the domestic sewage as well as the industrial effluents. My recent visit of the river’s stretch that flows between Kanpur and Varanasi made me realise that the river cannot take any more pollution load. This was also echoed by the officials from SPCB, Unnao and Kanpur. The Central Pollution Control Board (CPCB) report, 2013 explains that Ganga at Kanpur is also beyond repair. The drains at Kanpur carry a biochemical oxygen demand (BOD) load of 634,915 kg/day to the river. This is the highest among all the cities in Uttar Pradesh. According to the recent report of CPCB, Unnao (located on the river bank that lies opposite to that on which Kanpur is situated) also has two major drains—the Loni drain and the City Jail drain adding almost 12,068 kg/day of BOD load to Ganga. This is more than what four drains of Varanasi pour into Ganga. 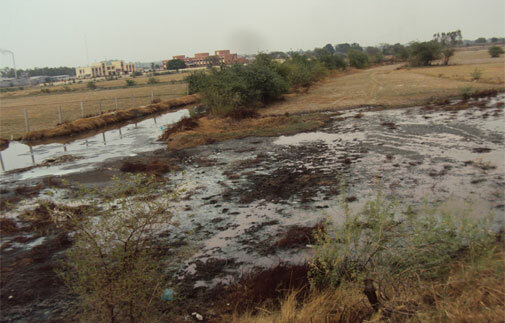 The river is also loaded with waste from a tannery hub in the Banthar area (along the bank of Ganga) of the state, along with domestic sewage that comes from Unnao due to mismanagement of drains,” says S Awasthi, environment expert of Banthar Industrial Pollution Control Company (BIPCC). One such example is the City Jail Drain where the water that is treated at the CETP (Banthar) flows into. The drain in turn carries the water to the main river. UPSIDC which is in charge of maintaining the drains here has failed to do so and according to Awasthi, this causes the river to get intoxicated by the waste. Regardless of the reason, the confluence of City Jail Drain and the river shows that the river is highly polluted by this drain. The failure of UPSIDC to maintain drains at Unnao surely poses a question whether the new project will be safe for the river which has already been killed near Kanpur. Have we learnt from mistakes? Now the question is that will encroachment from a project that will be housed just on the bank of the river floodplain lead to regular flood events in the area? The Yamuna flood plain that has been encroached by concrete structures like a Metro station, Akshardham temple, sports complex is a living example of the burden that floodplains are bearing. According to Professor Chandan Ghosh, head of Geo Hazards, National Institute of Disaster Management (NIDM), these encroachments call for major flood disasters in the region. Gupta argues that the project is not on a floodplain; it has rather been planned above the high flood level near a manmade bank (near Ganga barrage at Kanpur) of the river. There is a highway which acts as an embankment to prevent inundation at the project site. Karan confirmed that the location is not on the natural bank of Ganga but is surely on the floodplain. According to Ghosh, the road embankments may not always save the settlements from severe flooding. If the embankment has porous base, then flood water may enter through the embankment and inundate the basement levels of the buildings. Therefore, authorities need to take precautions for the present project. “There will be enough green spaces and water bodies built under this project to accommodate extra runoff due to concretisation,” says a government source. Just a couple of days back, Uma Bharti, Union Minister for Water Resources, River Development and Ganga Rejuvenation met Yadav to discuss issues of cleaning Ganga. They discussed about the major drains polluting the river and it has been decided that the drains will be tackled at strategic locations and river front development projects will also be initiated. 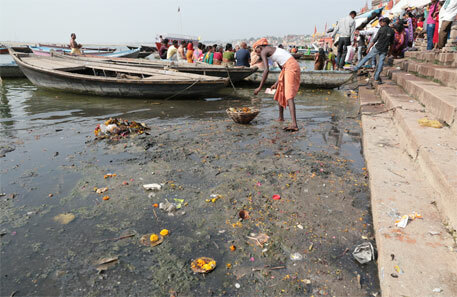 It seems that the Centre and the state governments have geared up to clean the river. But noble intentions alone cannot save the river. A project like Trans-Ganga should be designed very carefully is the river has to be saved. The state is boasting that the project will be first of its kind in the country which will house green, non-polluting industries. The drive of the project will no doubt inspire many urban planning solutions but authorities have to ensure that it does not become another means of making Ganga ‘maili’.